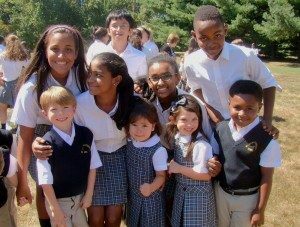 St. John’s Episcopal School values diversity. As a community, we are committed to racial, religious, ethnic, cultural, socioeconomic, age, family structure, gender, sexual orientation, and learning style, which strengthens our students’ ability to contribute and succeed in an increasingly diverse society. We seek a community that is committed to and inspired by the vision for our future. Our goal is to create a community that welcomes and embraces families from diverse backgrounds. There has been a significant commitment from the Board of Trustees, administration and staff to ensure we are accessible to as wide a range of families as possible and to ensure that every aspect of St. John’s, including school climate, student population, curriculum, faculty/staff/administration, and Board of Trustees, reflects the wide-ranging diversity of the Greater Olney Community. St. John’s Episcopal School was founded in 1961 by St. John’s Episcopal Church as an outreach to the Greater Olney Community. Our educational program seeks to nurture students of character and faith. Our Episcopal heritage compels us to reach out to persons of all faiths and backgrounds, affirming the common elements of our personal, spiritual, and communal growth. We seek to welcome and embrace people from diverse age, ethnicity, family structure, gender, learning style, race, religion, sexual orientation, and socio-economic status. We believe that the inclusion of people from diverse backgrounds and perspectives enriches the educational experience of all of our students and is vital to making them good citizens of the world. We are committed to fostering a climate in which issues of diversity are thoughtfully discussed and infused into the vision and direction of the school community. As a community of faith, we believe in the principles of equity and justice. We celebrate the dignity and worth of all our members. We feel a strong sense of responsibility to each other and to the greater community. As a responsible citizen of the Greater Olney Community, St. John’s Episcopal School strives to reflect this area’s increasing diversity.